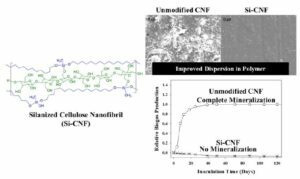 Ben Frank’s manuscript, entitled “Impact of silanization on the structure, dispersion properties, and biodegradability of nanocellulose as a nanocomposite filler,” has been accepted by ACS Applied Nano Materials. Read the manusrcipt online here. Benjamin P. Frank, David P. Durkin, Emily Caudill, Lingchao Zhu, Donald White, Michael L. Curry, Joel A. Pedersen and D. Howard Fairbrother, ACS Applied Nano Materials, 2018, Accepted.